this t-shirt showed up at our house the day after sam was born, and i've been meaning to take a picture of him in it, but he kept having incidents before i could get around to it. until today. thanks for the cute shirt aunt missy! it definitely speaks the truth. awww... that's so cute! 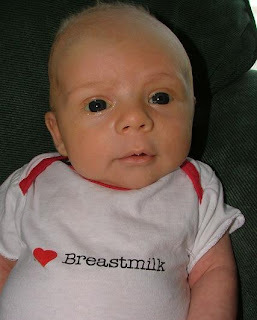 i need one that i can print - i'm going to slide it in the back of my MSHD badge so that when it flips around it'll be sammy lovin' breastmilk!